An artist's illustration of the New Horizons spacecraft flying by the Kuiper Belt object 2014 MU69 on Jan. 1, 2019. Recent observations suggest that 2014 MU69 may be a binary object. NASA's New Horizons spacecraft is zooming through the outer solar system with its eyes open once again. New Horizons woke from a five-month hibernation period — its first stretch of rest since before its epic Pluto flyby in July 2015 — last week, right on schedule, mission team members said. "It's another working science cruise through the Kuiper Belt for New Horizons," mission operations manager Alice Bowman, of the Johns Hopkins Applied Physics Lab in Laurel, Maryland, said in a statement. From now until mid-December, New Horizons will take the Kuiper Belt's measure, studying the region's radiation environment, gas and dust concentrations, and other characteristics. The spacecraft will also observe a number of Kuiper Belt objects (KBOs) from afar, using its telescopic camera, mission team members said. Flight controllers (from left) Katie Bechtold, Ed Colwell and Jon Van Eck, working in the mission operations center at the Johns Hopkins Applied Physics Laboratory in Laurel, Maryland, confirm data indicating that the New Horizons spacecraft had safely exited hibernation on Sept. 11, 2017. 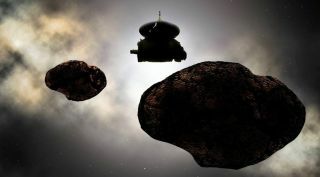 In addition, New Horizons' handlers will test the probe's scientific instruments, making sure everything is working ahead of a planned Jan. 1, 2019, flyby of a small KBO called 2014 MU69. This flyby — which will take New Horizons about three times closer to 2014 MU69 than it got to Pluto back in 2015 — is the centerpiece of the spacecraft's extended mission, which NASA approved last year. On Dec. 9, New Horizons will fire its engines to refine its course toward 2014 MU69. Then, on Dec. 22, the probe will go into hibernation again; it will wake on June 4, 2018, to prep for the upcoming flyby, mission team members said. The $700 million New Horizons mission, which launched in January 2006, got the first-ever good looks at Pluto during the spacecraft's historic flyby, revealing the dwarf planet to be a stunningly complex world with vast nitrogen-ice plains, towering mountains of water ice and a diversity of other landscapes. New Horizons is currently about 3.62 billion miles (5.83 billion kilometers) from Earth — so far away that it takes commands more than 5 hours to reach the probe at the speed of light.